The braking system on the RX-7 is already quite superior to nearly every other car on the road but there is always the potential to make it even better. Some problems we’ve found with the stock braking system on both the street and track is the lack of initial ‘bite’ when using the stock pads and/or brake fade, cracking or warping of the stock rotors, and lack in braking modulation (caused by stock brake lines). To overcome these issues and make the entire system work optimally, you have to address the cause of each problem and solve it in a logical manner. If you feel that after you brake hard a few times in a row your stopping distances are increasing, you’re likely to get the most benefit from upgrading to performance brake pads. If you are commonly hard on brakes or have had to/need to replace brake rotors due to warping or cracking, then upgrading to cross drilled or slotted rotors might be a solution for longer lasting and better performing rotors. And if you feel the brake pedal is just too soft or lacks the braking ‘feel’ you desire, even after a proper flushing of the brake fluid, then you want to look into upgrading to stainless steel brake lines which do not flex like the stock rubber lines. If you are upgrading just one component of the braking system, please make sure to check the condition of the other components at that time. If something else looks to be in need of service, it is HIGHLY advised that you repair it immediately. The Bönez Stage (I) Complete Brake Upgrade Package provides the ultimate in braking power for the street, drag strip, or occasional road racing and autocross. This brake package will yield improved brake pedal feel, increased stopping power, excellent brake modulation, and reduced brake temperatures. The kit includes the Bönez Stage (I) Brake Pads for the Front and Rear, Front and Rear Cross Drilled or Slotted Rotors and Stainless Steel Brake lines. Kit with x-drilled rotors shown. The Bönez Cross Drilled brake rotors offer many advantages over original brake rotors. 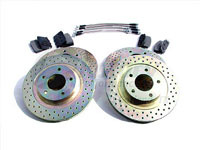 These rotors reduce stopping distances, brake temperatures, and unsprung weight. These benefits can enhance braking performance in wet and dry conditions, and increase brake pad life. Cross drilled rotors also enable the gases emitted under hard braking to vent and further improve braking predictability. To improve reliability and reduce stress points, all holes are CNC machined, radiused and then plated. Front rotors shown. 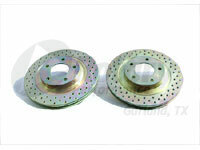 We now also offer the Bönez Slotted brake rotors which exchange exactly with the stock rotors. 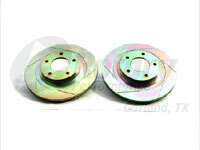 These rotors utilize six slots per side to vent excess gases out, keep the brake pad surface fresh for maximum bite, and promote cooling. The slots do not go to the edge of the rotor because we’ve found that to be a major cause of cracking and there are no gains in braking performance. Front rotors shown. The Bönez Stage (I) Pads are intended for the modified street car and/or racer (autocross, drag racing) who demands increased stopping ability with no brake fade. The Stage (I) compound requires a minimal amount of warm up for optimal braking and works well in all types of driving. 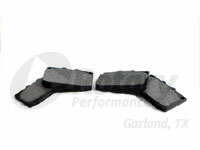 These pads are the ultimate choice for street driven cars, even ones using expensive custom wheels, because of their low noise and low dust characteristics. Front pads shown. When upgrading your brake system, consider the benefits of RP D.O.T. legal braided stainless steel brake lines. Because the construction of these lines are far superior to original equipment, they will not crack, split or burst. 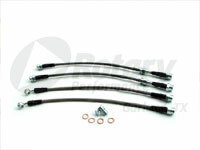 Upgrading to the RP Stainless Steel brake lines will greatly improve brake feel and response. These stainless steel brake lines are built to install in the exact same manner as the stock lines so no special tools or installation procedures are required. High performance cars need high performing fluid. 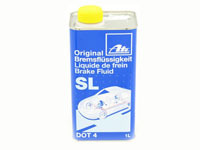 Here’s a favorite value, Ate SL brake fluid. The dry boiling point of this brake fluid is 500F and compares with the best. Sold in a one liter container to flush an entire system. © 2012 Rotary Performance, Inc. All Rights Reserved. Please direct comments or concerns here.